I've rarely been so excited to read an article. Last week when I saw Energy use and greenhouse gas emissions from turf management of two Swedish golf courses, by Tidåker et al., I immediately dropped what I was doing and read it. If you've talked with me about turfgrass management sometime in the past 18 months, our conversation may have touched on differences in energy use, and the difference in carbon emissions, caused by differences in grass selection and maintenance practices. In fact, this is one of the topics Dave Wilber and I discussed as part of our wide-ranging conversation during episode 14 of the Turfgrass Zealot Project. I don't know how to make these calculations yet, but finally with this article I've read something that provides the calculations, and that I can study so I can figure out how to do this myself. One can keep track of those quantities, together with the associated costs, and from that one can check the efficiency of the operation. These quantities also serve as some of the basic data requirements for the GEO OnCourse program. But the quantities we wrote about in the GCM article are all different: kg of N, kg of fungicide, L of water, L of diesel, kWh of electricity. By expressing all the turf maintenance activities in units of greenhouse gas emissions (expressed as CO2 equivalents) or energy use, one then has a single number for the entire course, or for an area of the course, or per square meter, that can be used to compare to other courses next door or around the world. And the use extends well beyond comparisons to other golf courses; one can use these units to compare the maintenance of a golf course to anything that has greenhouse gas emissions or energy use. I had high expectations for the article, and I wasn't disappointed. The authors described the fertilizer rates, topdressing rates, water use, mowing frequencies, and much more, for the two courses, and then expressed those units in GHG or energy use. N rates were up to 22 g/m2, as were K rates (I think the rates for golf course turf in Sweden should usually be less than reported in the article -- using precision fertilization, or temperature-based growth potential and MLSN, will lead to lower recommended amounts of fertilizer). Sand topdressing on greens was about 10 mm/year. Irrigation of greens was about 300 mm/year. Mowing of fairways was about 85 times/year, and greens were mown about 180 times/year. I think this is fascinating because one can consider Sweden to have relatively low inputs. 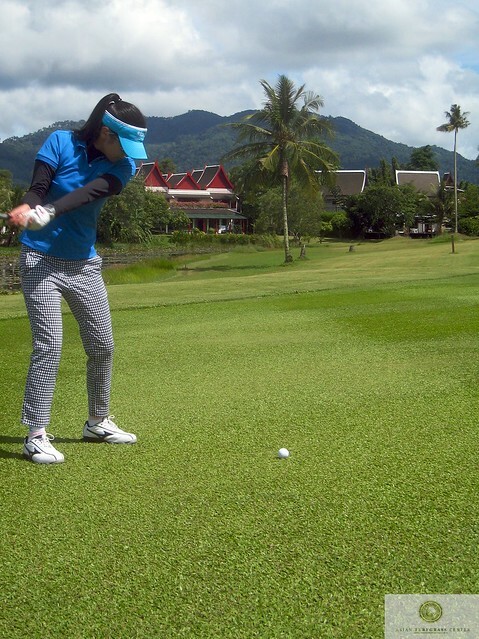 If you're familiar with golf course maintenance in a tropical environment, let's say in Phuket, you might expect fairways to be mown more than 150 times a year, greens more than 300 times, about double the fertilizer, and more than twice the water use. Now imagine what happens when comparing irrigated vs non-irrigated rough? Seashore paspalum wall-to-wall vs. manilagrass? A 60 ha sandcapped golf courses vs. one with drainage and 2 cm of sand topdressing? Overseeded vs. not? The differences in energy use and greenhouse gas emissions will be huge. Appropriate measures for reducing energy use and carbon footprint from lawn management are thus: i) reduced mowing frequency when applicable, ii) investment in electrified machinery, iii) lowering the mineral N fertiliser rate (especially on fairways) and iv) reducing the amount and transport of sand for dressing. Lowering the mineral fertiliser rate is of particular importance, since GHG emissions originate from both the manufacturing phase and from N turnover after application. Tropical carpetgrass (Axonopus compressus) can tolerate low mowing, even down to putting green height. Here it is invading a seashore paspalum (Paspalum vaginatum) nursery green. Even though carpetgrass can grow at putting green heights, I don't recommend it for greens. In the locations where carpetgrass can grow, manilagrass (Zoysia matrella) can too, and I prefer manilagrass putting surfaces. Why? Manilagrass has a finer leaf blade and I expect the ball roll will be more predictable across manilagrass than across carpetgrass. Carpetgrass on fairways -- I like that -- especially when mown at about 8 mm. And in the rough, under shade trees, tropical carpetgrass is the best choice in a tropical environment. These photos show more. How much irrigation is required at a particular location? That is an interesting question, and one gets widely different answers depending on the method used for calculation. The standard method involves taking the consumptive water use and subtracting the effective rainfall. That seems like it would be an effective way to calculate how much irrigation is required. However, that method doesn't explicitly consider the depth of the rootzone. Because managed turfgrass has a relatively shallow rootzone caused by low mowing heights, I think it makes more sense when making the calculations for turfgrass to find the irrigation requirement by using a daily soil water balance. Last week I made calculations of the daily soil water balance and from that calculated the irrigation water requirement. As an example, this is the volumetric water content (VWC) of a 15 cm deep rootzone at Fukuoka this year, assuming irrigation was supplied when the soil would drop below a VWC of 10%, and that the quantity of irrigation supplied at each irrigation event was enough to fill the soil to field capacity. To get the quantity of water required for irrigation, one adds up the water required for each of the irrigation events. By using the weather data for a particular location, and by adjusting the rootzone depth and field capacity and irrigation rules for that location, the daily soil water balance gives a value for the irrigation requirement that should be close to the real one. By irrigation rules, I mean how much water is applied at each irrigation event, and what the threshold VWC is for applying irrigation. For example, I calculated this for a 15 cm rootzone at Sapporo for the months of July, August, and September, using weather data for the past 10 years. When I calculate the daily soil water balance and then add up the amount of water required as irrigation for a 15 cm rootzone depth with the rules as shown on the chart, only 2 of the 30 months on the chart had an irrigation requirement of zero. Those are September 2015 and September 2016. The month with the highest irrigation requirement was August of 2008, with 82.7 mm; July 2007 had an 82.3 mm irrigation requirement. The median irrigation requirement for those summer months at Sapporo for the past 10 years was 42.5 mm/month. It rains a lot in Japan, so for a normal year, a large amount of the plant water requirement can be supplied by rainfall. That's why the irrigation requirement and the plant water requirement lines are separated. The gap between the lines represents the amount of water that is supplied by effective precipitation. The rootzone depth and the irrigation rules will also have an effect on the quantity of irrigation water required. The previous charts were for a 15 cm rootzone depth. This shows the difference between a 10 and 20 cm rootzone Fukuoka for the past 10 years. What about locations with less rainfall? Have a look at this chart with data from Stovepipe Wells in Death Valley, where it doesn't rain much, and you'll see the irrigation requirement by the daily soil water balance method is almost the same as the plant water requirement. Gelernter et al. used a daily soil water balance in their analysis of water use on golf courses in the United States. This approach has many applications. For example, one can predict an irrigation requirement given past weather data. One can also compare the actual irrigation amount to the predicted amount. And one can adjust irrigation rules and other parameters in the daily soil water balance calculations to find what the change in irrigation requirement would be if those adjustments were made. On a visit to Manila some time ago, I visited a golf course and had a look around with the golf course superintendent. Our discussion turned to seasonal changes in weather and the relative impact on the grass. For example, in the winter, when the temperatures are a little cooler, is it lower temperatures that have a big impact on slowing the growth? Or might it be the light, because the days in winter are a little shorter and the sun is a little lower in the sky? I made some calculations then, and reran the script now to refresh my memory about this. I calculated what the photosynthetic light would be on a sunny day in each month. That's how the photosynthetic photon flux density (PPFD) will be throughout the year when there are no clouds. It varies a bit. For the total light per day we can look at the daily light integral (DLI), and this is how the DLI changes through the year. The PPFD is how much light reaches the turf every second. Adding together the light from each second, from sunrise until sunset, gives the total amount for the day -- the DLI. What about temperature? Manila is 13 degrees north of the equator with a tropical climate. The coldest month is January, with an average temperature of 25.6°C. The hottest month is May, with an average temperature of 29.5°C. That's a difference of 3.9°C from the coldest to the hottest month. The sunny day DLI ranges from about 44 to 59 mol m-2 d-1. So which changes more, the temperature, or the light? To look at that, I plotted the standard score (z-score) for the DLI and for the temperature across 12 months. The z-score shows how many standard deviations a value is from the average (mean). If the z-score is less than 0, that means the value for that month is less than the average for the year. If the z-score is more than 0, that means the value for that month is more than the average for the year. Because the z-scores are standardized, I can compare directly the DLI and the temperature, and how much they are changing in any one month, compared to their average value during the year. At Manila on sunny days, the temperature varies relatively more than the light in January, February, April, and May. In March, and from June through December, the light varies relatively more than the temperature. I just finished reading Winston Mirmow's thesis on Fall potassium fertilization and winter traffic effects on a creeping bentgrass putting green. I downloaded this in September and read the abstract then, but only read the full thesis now. As I've mentioned previously, I like reading theses, because they are the most recent research results presented in a detailed format. I can learn new things and correct my thinking if I've been in error about something. I really enjoyed this one. It was about two of my favorite topics: potassium (K) and winter traffic. You can read the thesis yourself if you like. Here are the three things I found most interesting. First, the fertilizer. Adding supplemental K in the autumn had no effect on traffic damage over frozen turf in the winter. Where no K was added was the same as where K was added. The low rate was 0 K, and the high rate was 7.3 g K/m2 (1.5 lbs K/1000 ft2). Second, traffic was applied at 8 a.m. to the creeping bentgrass green when the canopy temperature was below freezing. That worked out to be 19 traffic events in the first winter of the study, and 18 traffic events in the second winter of the study. Yes, traffic decreased the turfgrass quality. The trafficked turf was worse than the untrafficked turf from January 15 until March 15. But guess what? The untrafficked turf in mid-winter was rated at less than acceptable quality too, from February 1 to March 15. The trafficked turf was worse, and the untrafficked turf wasn't very good either. And then when the temperatures warmed up in the spring? "When the weather warmed to the point where no more traffic treatments were applied, there were no significant differences in turfgrass quality ratings." That is, by April 1, all the plots were the same, whether they had been protected from traffic when frozen, or whether they had received 8 a.m. traffic over frozen turf. Third, the soil K was below the MLSN guideline and the grass did not respond to K fertilizer. That's not at all what this experiment was about, but it shows something that I often explain, and will do so here again. Even though the MLSN guidelines are lower than conventional soil nutrient guidelines, they are still set to be conservative. By that I mean the quantity of fertilizer recommended when using the MLSN guidelines is deliberately meant to err in one direction -- on the side of too much fertilizer, rather than too little. Of course the MLSN approach will in most cases recommend less fertilizer than will conventional guidelines, but at the same time there is a built in margin of error to make sure there is no deficiency. Results like those presented by Mirmow, where the soil is below the MLSN level (Mirmow's results, converted to Mehlich 3 units, had values in the 20 to 30 ppm range), but the grass does not respond to applications of the element, indicate that the element was not deficient. Thus, more confidence that the MLSN guidelines are conservative. I used to be horrified of traffic on frozen bentgrass. I still kind of am, but I have also seen all kinds of traffic on frosted or frozen or snow-covered bentgrass. And my observations of what happens are similar to Mirmow's research. The traffic makes the grass worse than where no traffic occurred, but in early spring everything is back to normal. These are the practice greens at Habu CC near Tokyo in mid-March. This is after a winter of play on frosted greens, of snow removal by any means possible so that golf could be played, and by mid-March these greens were already recovered from the damage. I was pleasantly surprised to see the soil test and tissue test data shared in their entirety in this thesis. That's great. However, for the soil test data, the methods section doesn't give the sampling depth. And the methods section only says which lab the analyses were conducted at, but not which testing method was performed. Because both the sampling depth and the testing method affect the soil test data, authors of technical papers should include that information. I looked up the lab in this case, and can infer that the test was Mehlich 1. I've reviewed a paper recently with the same issues. Essentially, it said soil samples were sent to X lab for analysis and the results are in Table Y. That's fine, but one can't understand the numbers unless some details of the analysis are given. One is an article, another is a podcast, and you won't regret the time spent reading the first and listening to the second. First, the 4 November issue of the Green Section Record contains Managing Organic Matter in Putting Greens by Adam Moeller and Todd Lowe. This article explains that "there are many agronomic programs that influence the playability and health of putting greens, but organic matter management is arguably the most important." It goes on to explain the standard practices in 2016. Moeller and Lowe conclude that "traditional programs", and by that they mean programs that include core aeration, "still provide the most consistent results for managing organic matter and improving putting green conditions." This is a really good article for referencing what is standard in 2016, but I'm not in full agreement with their conclusion. I used to think that coring was essential, but over the past few years I've changed my thinking. More about that in the footnote. The second item is the recent TurfNet Radio podcast with Frank Rossi and Chris Tritabaugh about managing for the Ryder Cup. If you listen to this, you will find that they discuss organic matter on putting greens (and a lot of other interesting things), but if you haven't heard, there has been no core aeration on the greens at Hazeltine since 2013. The article says coring provides the most consistent results, and the podcast explains how greens are managed to a high standard without coring. It's good to be informed about this topic, so that you can be sure to make the right choices for any turf that you manage. Footnote: I used to recommend the removal of 20% of the putting green surface area by coring each year and the annual addition of at least 12 mm of sand topdressing. I don't make that recommendation anymore. Rossi and Tritabaugh talked about the grass yield and growth rate. How much was the grass growing? The idea being that one can match the quantity of sand applied to the rate of grass growth, thus avoiding coring by maintaining a consistent organic matter content at the soil surface. But they did not put a number to the growth rate. I think it is possible to put a number to the growth, and from that to make a site specific plan for organic matter management. Consider the "new" bentgrasses with high shoot density, or ultradwarf bermudagrasses, widely considered to be prolific thatch producers. Please consider now how much thatch bentgrass will produce in Bangkok, or how much organic matter Miniverde will produce in Moscow. None, right? Now please continue that thought experiment a step further, and consider how much thatch (or organic matter) grasses produce when they grow slowly, supplied with just enough nitrogen and just enough water to produce the desired growth rate. Supply no N and no H2O to ultradwarf bermudagrass and there won't be any organic matter to manage. Is it possible that there is a level of growth at which minimal topdressing and no coring produce the desired surface? That's the goal, and I think it is possible with careful attention to the growth rate. And that avoids (or at least minimizes) the putting surface disruption associated with coring too. Jason Haines on how the MLSN guidelines changed the way he fertilized the golf course. Haines on how the temperature-based growth potential changed the way he fertilized the golf course. Application of the grammar of greenkeeping. A disturbing photo of lots of large patch. Dan Washburn on golf in China. Eric Reasor on managing bermudagrass off-types on putting greens. A Ryder Cup miscellany, in charts. Winter is coming to Iceland. Golf, health, and multifunctional facilities. These are the top 25 tweets from the Ryder Cup, with an asterisk. Jeff Johnson showed amazing surfaces produced with ag grade fertilizers. Soil water balance (and implied irrigation water requirement) at Sapporo from 2013 to 2016. Daily and monthly calculations of ET and irrigation requirement, with some especially interesting comments. More from Haines, on turfgrass diseases. How much coring is really necessary? For more about turfgrass management, browse articles available for download on the ATC Turfgrass Information page, subscribe to this blog by e-mail or with an RSS reader - I use Feedly, or follow asianturfgrass on Twitter. Link and article roundups from previous months are here. "Sorry if this is a rubbish question"
"I don't really need to show any data for this to be certain"
"Already proving to be more valuable than I originally expected"
"Don't try to jump on his bandwagon"